Heated seats are a good addition to your car if you want to stay cozy when the cold weather comes in. They warm you up fast, and they can sometimes be good for your back and shoulders if you have joint pain. If you are just trying to use your seat covers to keep cozy in the wintertime, then you need to pick a seat cover that warms up faster than your heater. After all, if your heated seat cushion starts to get hot once everything around you is already heating up, then there is really no point in having the heated seat cushion at all. If you live somewhere with extremely variable temperatures, then you should consider a heated seat cover that allows you to adjust the temperature. With the right heated seat covers in your car, you will not need an expensive luxury car in order to stay warm and comfortable during the winter. Alternatively, you might not care about the cold weather, but you still want to consider picking out a heated seat cover anyway because some cushions have the added benefit of giving you massages or keeping your metabolism balanced. Whatever the reason you want a heated seat cover, when purchasing a cushion, you also want to keep in mind how well it will fit on your seat. Therefore, you may want to ensure that the seat cover has straps to prevent it from falling off or you may decide that you need a cushion that comes in a very specific color that you think would look good in your car. In order to pick the right seat cover for you, you need to figure out what your needs are. You just have to make sure you choose to buy the right quality seat cover that will work best for you. The Five S is a massage cushion. 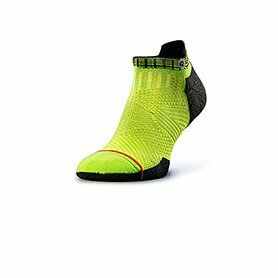 It is designed to support and comfort many different zones on your body. 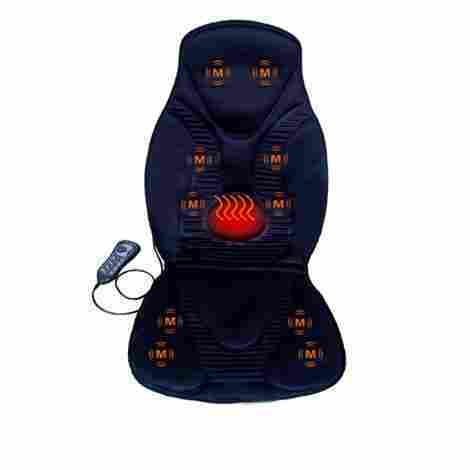 It provides both heat and vibration massages when you are in the car. However, if you enjoy it, then you can definitely take it inside and use it whenever you want. 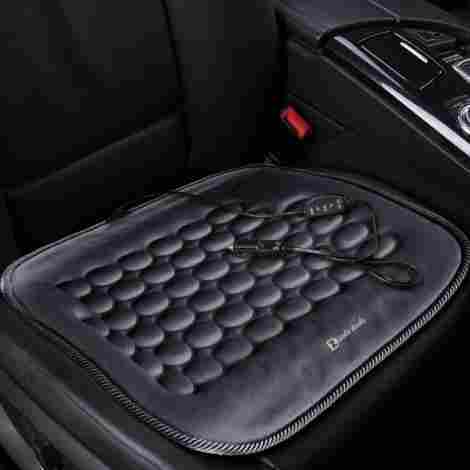 This heated seat cushion covers the entire seat in your car in order to soothe as many regions of your body as possible. These regions include the joints and muscles in your back, shoulders, neck, and thighs. You can adjust the massager. You may have different preferences for the speed, intensity, and location of your vibration massage. This seat cover has many different options for massages with four massage programs and three-speed settings. It costs slightly on the pricey side. However, it is relatively cheap for a massage seat that is designed for your home. Additionally, the quality of the seat is very good, and it will probably last you a long time before it breaks. If it does break, it has a three-year warranty. The Zone Tech seat cover is primarily designed for cold weather, but the heat can still soothe any of the sore muscles in your thighs. It will get your blood flowing because it works fast. You can pick a heat setting. There are multiple heat settings on this heated car seat cover. Therefore, the Zone Tech will work if you live in an area that might experience varying temperatures during the winter time. The straps prevent it from falling over. The cushion has multiple straps to keep it firmly in place. You can shift around in your seat all you want, but the cushion will always stay attached to the seat. It costs actually relatively cheap, but you do not have to worry that you are buying a poor quality product. It will consistently work faster than your heater, and it is designed to last for a long time. This heated car seat cushion reaches a very high maximum temperature to keep you warm if the weather is cold. It also provides lumbar back support, which makes it feel extremely comfortable in any temperature. It has a maximum temperature of 114 degrees F.
114 degrees F (45.6 degrees C) is pretty hot, so this cushion will definitely keep you nice and toasty. If that is too warm for you, then you can choose the lower temperature setting, which heats up more slowly and will only reach 114 degrees if you leave it on for several hours. It is designed to fit in any car. The universal fit construction of the Wagan IN9438 means that it will probably fit in any car, regardless of the size and shape of your seats. It also comes in more than one size, so you can ensure that this seat will definitely fit. Wagan is considered pretty high quality and reputable brand for car gear. However, this cushion still only costs somewhere around $20-$23, depending on the size that you choose. This seat gets extremely hot, which is why it is primarily designed for keeping you warm in the coldest of winters. Its material and design will also make sure your muscles do not cramp or get sore during longer drives. The AUDEW heated seat cover might have a maximum temperature of 140 degrees F (60 degrees C). However, you never have to worry about getting burned. The cushion has a cooling system in place that prevents overheating, so it will never get too hot. The heat delivery is even and consistent. 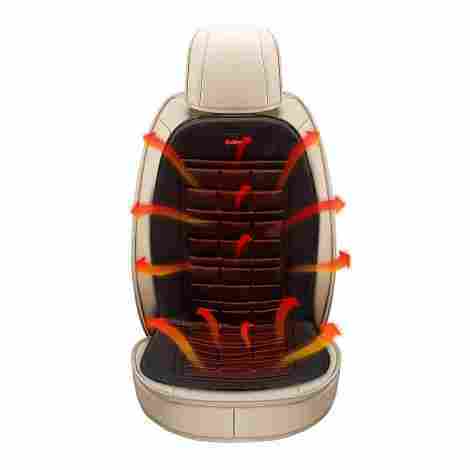 The seat is designed so that heat is never overly targeted at one region of your body. Inside the seat, there is carbon fiber wiring that is arranged in a way to deliver fast, consistent, and even heat. This heated car seat cover costs a reasonable price for a winter seat heater with a high-quality design that can also work to soothe joint pain during long drives. 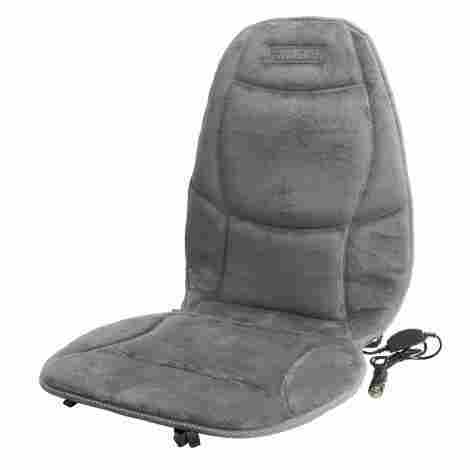 As the name of the product might suggest, this heated seat cushion is another seat cover designed to primarily ease any joint and muscle pain that you might be experiencing while you drive. It offers a lot of support. The Relaxzen has a thick and padded neck rest. It also has more support around your lower back. The padding in the support is made from memory foam so that it will take the perfect shape for your body. There are a lot of massage settings. With ten different vibrators spread throughout the seat, you can probably find a massage setting that suits you best. After all, there are five different massage programs that differ in location, speed, and intensity. This seat cushion is cheaper than the older model of this same chair, but it is still relatively expensive. However, the quality of the product is very good with its well-placed motors and heaters. In order to relieve some of your joint and muscle tension and pain, this massage seat cushion is for providing your back, shoulder, and thighs with heat and massage therapy while you sit. It has a lot of variety. With this heated massage chair, you can get a gentle heated massage, a deep penetrating massage, or anything in between in order to relieve your stress. It has eight different patterns, so it will be easy to find an option that matches your preference. It covers six zones in your body. 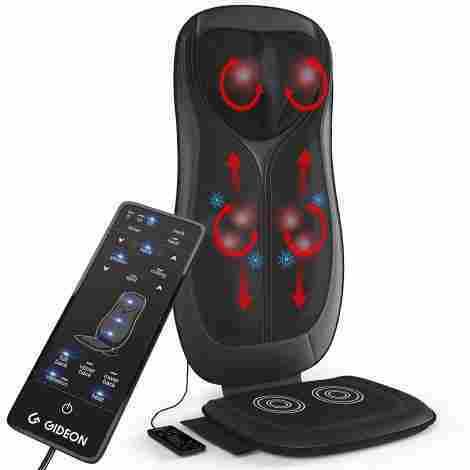 The Gideon Massager can give you pain relief at many points in your back and legs. The zones that it covers include multiple regions of your back, neck, shoulders, and thighs. Because of all the variety, this seat cover is relatively expensive. However, it is an effective way to get rid of stress and tension in your muscle, and the heat works well to warm up your lower back. The design of this chair will make sure that your muscles and tissues stay nice and warm as the rolling balls inside the chair provide your muscles with therapy that will ease any pains in and around your back. The massage motion resembles the hand motions used in a real massage. The rotation of the rolling balls in the chair mimic the rotation of a true massage in order to give your muscles a deep massage on three different zones of your back. The massage nodes are flexible. You can move the nodes around so that they fit comfortably around your body. There is also a spot massage option if you want everything to be focused in one area. Since this seat is essentially a shiatsu massage chair, this chair is definitely on the expensive side. However, it is still reasonable to consider it provides extreme comfort and high-quality heating units. This thin heated seat cushion has a wide range of temperature settings to keep you warm when the weather gets cold. It also comes with multiple timer settings to make sure that it eventually turns off. There are three temperature settings. There are two warm temperature settings at 86 degrees F (30 degrees C) and at 140 degrees F (60 degrees C). There is also a cooler option at 37 degrees F (3 degrees C). It has an “intelligence” temperature controller. You can set the temperature at one of the three temperature settings. Once it gets too hot, it will shut off. However, it will start up again when it senses that your car is getting too cold again. The cost of this heated seat cushion is definitely somewhat more expensive than some other heating options because of all the different temperature settings that the Kingletting provides. Made with a comfortable polyester design, the Sojoy SJ154A seat cover is a car heated seat cover that will heat up your car quickly and will keep you warm in the winter time. It has a high maximum temperature. There are two temperature settings on this seat cover. With the high setting, the maximum temperature of this car seat is about 115 degrees F (46 degrees F), so it will definitely keep you cozy. It comes with a timer. With the timer, the seat cover will only stay hot for about thirty minutes of driving. After the thirty minutes pass, it will shut off in order to prevent overheating. This heated seat cover is definitely on the cheaper side. After all, it does not have any added comfort or pain relief features. However, it still works well to ensure that you do not get cold. The Zento Deals heated seat cover comes as a two-piece set. It works well to heat up quickly in order to keep you nice and warm during the winter time. It fits in any car. 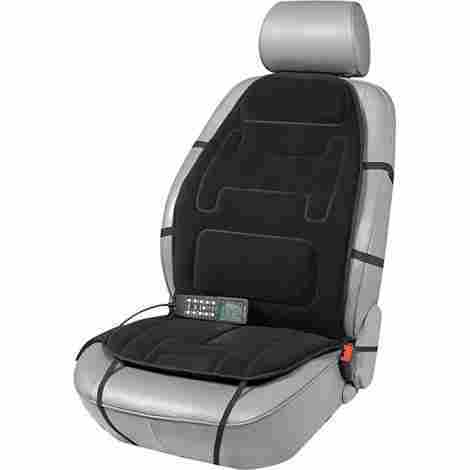 The design of this heated seat cover specifically allows the cushion to fit nicely on any type of seat. Therefore, it will work in cars, RVs, trucks, and even boats. You can control the temperature. There are two temperature settings on this heated seat cover. Therefore, depending on the weather outside and on your personal preferences, you can easily control whether you want to be mildly warm or incredibly toasty. This product is definitely relatively reasonably priced. You are also likely to get a lot of use out of it because it tends to last a long time. 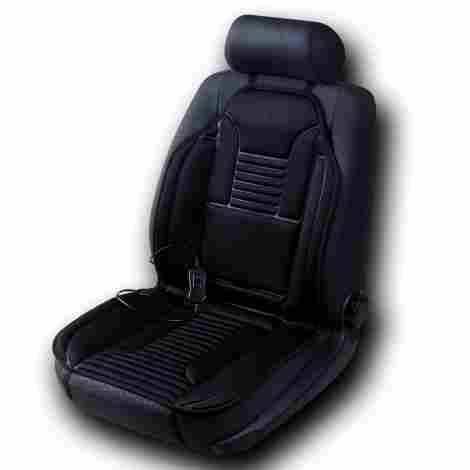 The bottom line is that there are a lot of heated seat covers across the market that work in both your home and your car. They function to increase the blood circulation throughout your body, which will soothe your joints and keep you warm when the weather starts to get cold. Different covers will have different designs, features, benefits, costs, and levels of quality. By figuring out what your specific heat and chair preferences are, you should be able to find a heated seat cover that will work well for both you and your car or home. You need to make sure that it is safe, that it heats you up nicely, that it fits well on whatever seat you choose to use it on, and that it keeps you comfortable while you are sitting down. While there might be a range of options for you to choose from, it is definitely possible to find the right model for you as long as you know what you are looking for. Sometimes, there are so many different features in your seat covers that you have to think about that it might be difficult to truly figure out what model might be the right fit for you. In order to evaluate different products, certain criteria must be used. When it comes to purchasing heated seat covers, here are some of the criteria taken into consideration in order to properly rank which ones should be considered the best and which ones are best ignored. Heated cushions would definitely be somewhat pointless if they did not help you get warm quickly enough. You might not have time to sit around for your cover to set hot. Since most seat cushions can be powered by your car, you also want to make sure that you do not reach your destination before your back starts to get comfortable. The speed is especially important if you are living in a cold area and own a car that has a slow heating unit. You should not be freezing in your car for too long, so car heated seat cushions can help you as long as they heat up fast. The best cushions only take about two minutes to reach their maximum temperature. This speed is definitely incredibly fast, especially considering that some of these cushions have an extremely high maximum temperature, which means you will probably end up turning off the heat function before it reaches this temperature. By turning it off or turning it down relatively quickly, you can save the battery and allow your seat cover to last longer. The lower ranked models might take anywhere between three and twenty minutes to reach the maximum temperature. Twenty minutes might seem like a long time, but you will probably start feeling warm long before the seat cover reaches its maximum temperatures. You will never have to wait longer than five minutes before you start to feel reasonably comfortable. Everyone has different preferences when it comes to heat. Additionally, the weather might vary where you live, which may affect your temperature preferences. You do not want the heated seat covers to be either too hot or too cold, so it is definitely important for you to be able to have some level of control over how warm you are. Therefore, most of the best products have settings that allow you to adjust the temperature. Most of them only have two temperature settings plus an off switch. However, some of them have more temperature settings than that. Some of them also have certain safety features that will prevent overheating so that your skin does not get burned. If you want a heated seat cover to stay comfortable in the winter time, it sort of ruins the point if the cushion is uncomfortable. Wires and motors might stick out, which may make it difficult to sit for a long time. Additionally, if you want the heat in order to ease up any joint pain, then uncomfortable covers are definitely a problem. Therefore, the best seat cushions are all designed to keep you comfortable. They should nicely support your back and shoulders, they should not have any hard parts that stick out, and they should be made from a soft material. 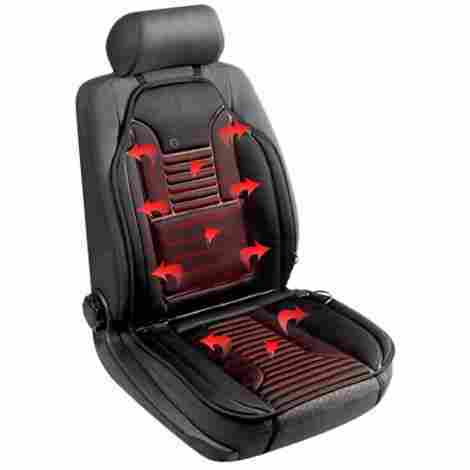 Some of the additional features offered in these heated seat covers are important, especially if you are choosing to get a heated seat cover in order to give you pain relief. While heat definitely works for pain relief, massages do too, which is why you want to consider seat covers that offer vibration or shiatsu massages. The massage feature is ideal if it covers multiple regions of your back, neck, shoulders, and thighs. It is also helpful if there are many different types of massage settings so that you can control the speed, location, and intensity. When the heat is not evenly distributed, it might be more difficult to stay warm. While the best massage covers might only focus on distributing heat to your lower back, they will deliver heat all the way across your lower back. The best-heated seat covers that are not designed specifically for massages will have an even more consistent heat distribution, often delivering heat to both your back and your thighs. Without this even heat distribution, the heating feature might not work as quickly as you would probably like it too. Whenever you purchase an item, you always want to make sure that you are getting a sufficient amount of use of that item. Otherwise, the purchase may seem as though it was not worth your money. Therefore, you should not choose seat cushions that will not get you through the entire winter. Ideally, heated seat covers should last for several years. Of course, this expectation might not be realistic for some of the cheaper models, but all of the models are constructed so that they can last for a reasonable amount of time-based on its cost. When considering the durability of the seat covers, you may think that the design and quality of the heating and massage units are the most important aspect of the seat cover to consider. However, there are other things you must consider as well. For example, you should pay close attention to the material. The best seat covers are made from materials that are built to withstand the heat that they are effectively conducting. Evaluating cost is obviously very similar to evaluating durability. However, durability is not the only thing that affects the cost of an item. The number of features in the heated seat covers will also impact how expensive it is. There is definitely a variety when it comes to the price of heated seat covers, but all the best models are within a reasonable price range. The more expensive ones will last a long time, have better massage features, and increased control of temperature and intensity. The cheaper models might have fewer extra features, or they might not last for such a long time. If your seat cover does not fit well in your seat, then it might not be particularly useful to you. Therefore, adequate extension cords and proper dimensions are both important. Most of the best seat cushions are designed to fit in any car. They also have straps to keep it from moving around. The straps will also be easy to understand because you should not have to stare at complicated diagrams and instruction manuals in order to figure out how to properly set up your heated seat cover. The aesthetic value may not be the top priority for evaluating heated seat covers, but the appearance was still sometimes taken into consideration. After all, while the way a heated seat cover looks definitely does not affect how well it is going to work, you do not have to be forced to choose a heated seat cover that makes you cringe every time you look at it. It should not look too awkward and too bulky. Therefore, most of the best seat covers simply look like an extension of the chair. Q: Are car heated seat covers only for the person sitting in the driver’s seat? A: Technically, any car heated seat cover can be used on any seat in the car as long as you have an extension cord or multiple 12V outlets in your car. However, some cushions are definitely specifically designed for the driver’s seat. If you are interested in putting car heated seat covers in the passenger’s seat or in the back row, then you need to make sure the cord is long enough. Additionally, if the cord comes out of a specific side of the seat, it might be difficult to use on any seat beside the driver’s seat. Therefore, you definitely need to do some research on the cord before you use heated seat cushions for other passengers in the car. Q: Can a seat heater be dangerous? A: Heated seat covers are obviously a heating product, so there is always a little bit of a chance that they can burn you. Too much exposure to seat covers can result in rashes on your skin, so you definitely cannot overuse it. It might take a while to notice some of the rashes that can occur because they usually appear on the back of different body parts, which is not an area that is necessarily easy for you to see in a mirror. Additionally, any electrical product can sometimes pose as a fire hazard. Therefore, you want to make sure that all visible wiring does not look worn out and you should not leave anything plugged for too long, especially if you are not using it. Q: Do the massage covers have an option to run the heating feature without the massage feature? A: Most of the massage seat covers allow you to choose when to turn on the heat, meaning that you do not need to get a massage in order to have the heat turned on. Additionally, you do not need the heat to be on in order to have the massage feature turned on. Both features should run independently. Q: Can you put seat covers underneath another seat cover? A: As long as you are making sure that nothing in your car or home that is burning, you can definitely stack seat covers on top of each other. It might not necessarily be an easy task, especially if you chose a rather bulky heated cushion, but it is definitely possible. Putting your heated seat cover underneath another cover might even be a good idea if some of the wires or motors in your heated seat cover are sticking out and making you uncomfortable. It also might be a good idea if you are unhappy with the way it looks on your seat. Of course, the features will not work as well if they are underneath another seat cover. It might not get as warm, and any massage cover will be less powerful. Q: Does the actual seat material matter? A: The material of the seat on which you are putting your seat cover can make a tiny bit of a difference. The material of the seat can be especially impactful when it comes to whether or not the seat cover is likely to move around. However, most seat covers are designed to move around as little as possible. The best ones usually come with straps and are made from materials that are likely to generate enough friction to prevent it from shifting around too much. Therefore, while the material of the chair might make a difference, the difference it can make is pretty much negligible, so it probably will not matter, and you should not worry about it. Q: Will it use up car battery if you accidentally leave it plugged in? A: The best car heated seat covers probably will not use up car battery if you forget to unplug it when you leave the car. However, some of them might. Additionally, it is always better to unplug the seat covers and turn it off when you are not using it. Even if the battery does not drain, it can still pose as a fire hazard if you keep things plugged in, especially if there are no built-in safety features to prevent fires. Q: Do you need the massage feature in order to relieve pain? A: Heat alone can help with any pain that you might be experiencing. You might want to consider finding a heated seat cover that also provides you with massages. Even if you do not have joint pain, you should know that sitting for a long time can cause cramps, so car heated seat covers that provide vibration massages are pretty helpful for long journeys.